Adams, R., 1991, The Wadi Fidan Project, Jordan. Levant 24:181-183. Banning, E., 1995, Herders ... or Homesteaders? Biblical Archaeologist 58:2-13. Banning, E., and Byrd B., 1989, Renovations and the Changing Residential Unit at 'AinGhazal, Jordan. In Households and Communities, edited by s. MacEachern, D. Archers, and R. Garvin, pp. 525-533. Chacmool, the Archaeological Association of the University of Calgary, Calgary. Banning, E., Rahimi, D., and Siggers, S., 1994, The Late Neolithic of the Southern Levant: Hiatus, Settlement Shift or Observer Bias?The Perspective from Wadi Ziqlab. Paléorient 20:151-164. Banning, E., Dobs, R., Field, J., Kuijt, I., McCorriston, J., Monckton, S., Rubenstein, R., and Sheppard, P., 1989, Wadi Ziqlab Project 1987: A Preliminary Report. Annual of the Department of Antiquities ofJordan 3343-58. Bar-Yosef, O., 1981a, The "Pre-Pottery Neolithic" Period in the Southern Levant. In Préhistoire du Levant, edited by J. Cauvin and P. Sanlaville, pp, 551-569. Colloques Internationaux du Centre National de la Recherche Scientifique, No. 598. Editions du Centre National de la Recherche Scientifique, Paris. Bar-Yosef, O., 1981b, Neolithic Sites in Sinai. In Beitrage zur Umweltgeschichtedes Vorderen Orients, edited by W. Frey and H. Uerpmann, pp. 217-233. Dr. Ludwig Reichert Verlag, Wiesbaden. Bar-Yosef, O., and Alon, D., 1988,NahalHemar Cave. 'Atiqot 18. Graphpress, Jerusalem. Bar-Yosef, O., and Belfer-Cohen, A., 1989, The Levantine "PPNB" Interaction Sphere. In People and Culture in Change, edited by I. Hershkovitz, pp. 59-72.British Archaeological Reports, International Series 508, Oxford. Bar-Yosef, O.,and Meadows, R., 1995, The Origins of Agriculture in the Near East. In Last Hunters, First Farmers, edited by T. D. Price and A. Gebauer, pp. 39-94. School of American Research Press, Santa Fe, New Mexico. Bar-Yosef,O.,and Phillips,J. (eds. ), 1977,PrehistoricInvestigationsin GebelMaghara,Northern Sinai. Qedem 7, Monographs of the Institute of Archaeology, Hebrew University,Jerusalem. Bennett, C., 1980, Soundings at Dhra',Jordan. Levant 12:30-39. Betts, A,, 1990, The Pre-Pottery Neolithic in Eastern Jordan. Paléorient 15: 147-153. Borzatti von Lowenstern, F., 1984, Pitture Schematiche in Ripari Sotto Roccia nel Deserto della Giordania. Studiper I'Ecologia del Quaternario 6:71-80. Braidwood, L., Braidwood, R., Howe, B., Reed, C., and Watson, P., 1983,PrehistoricArchae-ology along theZagrosFlanks. Oriental Institute Publications, Volume 105. University of Chicago Press, Chicago, Illinois. Braidwood, R. and Howe, B., 1960, Prehistoric Investigations in Iraqi Kurdistan. Studies in Ancient Oriental Civilization, No. 31. University of Chicago Press, Chicago, Illinois. le Brun, A,, 1969, Beisamoun. Israel Exploration Journal 19. Byrd, B., 1994, Public and Private, Domestic and Corporate: The Emergence of the Southwest Asian Village. American Antiquity 59:639-666. Cauvin, j,, 1985, La Question du "Matriarcat Préhistorique" et le Rile de la Femme dans la PrÇhistoire. In La Femme dans leMondeMediterranéen, edited by A. Vérilhac, pp. 7-18. Travaux 10, Maison de l'Orient, Lyon. de Contenson, H., 1971, Tel Ramad, a Village of Syria of the Seventh and Sixth Millennia B.C. Archaeology, 232:278-285.
de Contenson, H., and Van Liere, W., 1966, Seconde Campagne O Tell Ramad 1965: Rapport Préliminaire. Annales ArchéologiquesArabes Syriennes 16: 167-176. Davis, J., Simmons, A,, Mandel, R., Rollefson, G., and Kafafi, Z., 1990, A Postulated Early Holocene Summer Precipitation Episode in the Levant: Effects on Neolithic Adaptations. Presented at the 55th annual meeting, Society for American Archaeology, Las Vegas. Echegaray,J., 1964,Excavacionesenla Terrazade 'EIKhiam (Jordania), Volume 1. Biblioteca Prehistorica Hispana, Volume IV, Madrid. Echegaray,J., 1966, Excavaciones en la Terraza de 'ElKhiam (Jordania), Volume II. Biblioteca Prehistorica Hispana. Volume V, Madrid. Finlayson, B., and Mithen, S., 1999, The Dana-Faynan-Ghuwayr Early Prehistory Project: Second Interim Report—1998 Field Season. Unpublished manuscript, on file at Centré for Field Archaeology, University of Edinburgh, Scotland. Flannery, K., 1972, The Origins of the Village as a Settlement Type in Mesoamerica and the Near East: A Comparative Study. In Man, Settlement, and Urbanism, edited by P. Ucko, R. Tringham, and G. Dimbleby, pp. 23-53. Duckworth, London. Flannery, K., 1993, Will the Real Model Please Stand Up: Comments on Saidel's "Round House or Square?" Journal of Mediterranean Archaeology 6:109-117. Galili, e., Weinstein-Evron, M., Hershkovitz, I., Gopher, A,, Kislev, M., Lernau, O., Kolska-Horwitz, L., and Lernau, L., 1993, Atlit-Yam: A Prehistoric Site on the Sea Floor off the Israeli Coast. Journal ofField Archaeology 20: 133-157. Garfinkel, Y., 1993, The Yarmukian Culture in Israel. Paléorient 19:115-134. Garfinkel, Y., 1994, The PPNC Flint Assemblage from Tell 'Ali In Neolithic Chipped Stone Industries of the Fertile Crescent, edited by H. Gebel and S. Kozlowski, pp. 543-562. Studies in Early Near Eastern Production, Subsistence, and Environment I. Ex Orient, Berlin. Garrard, A., Baird, B., Colledge, S., Martin, L., and Wright, K., 1994, Prehistoric Environment and Settlement in the Azraq Basin: An Interim Report on the 1987 and 1988 Excavation Seasons. Levant 26:73-109. Garrard, A., Colledge, S., and Martin, L., 1996, The Emergence of Crop Cultivation and Caprine Herding in the "Marginal Zone" of the Southern Levant. In The Origins andSpread of Agriculture and Pastoralism in Eurasia, edited by D. Harris, pp, 204-226. University College London Press, London. Gilead, i., 1990,The Neolithic-Chalcolithic Transition and the Qatifian of the Northern Negev and Sinai. Levant 22:47-63. Gopher, A,, 1994,Arrowheads of theNeolithicLevant. Dissertation Series 10, American Schools of Oriental Research. Eisenbrauns, Winona Lake, Indiana. Gopher, A,, and Gophna, R., 1993, Cultures of the Eighth and Seventh Millennia BP in the Southern Levant: A Review for the 1990s.Journal of WorldPrehistoty 7:297-353. Goren, Y., 1990, The "Qatifian Culture" in Southern Israel and Transjordan: Additional Aspects for its Definition. Mitekufat Haeven 23:100-112. Hershkovitz, I. (ed. ), 1989, People and Culture Change: Proceedings of the Second Sympo sium on Upper Paleolithic, Mesolithic and Neolithic Populations of Europe and the Mediterranean Basin. British Archaeological Reports, International Series 508, Oxford. Jobling, W., and Tangri, D., 1991, A Pre-Pottery Neolithic Site in the Hisrna Basin, Southern Jordan. Paleorient 17: 141-148. Kafafi, Z., 1982, The Neolithic of Jordan (East Bank). Ph.D. dissertation, Freien Universitat, Berlin. Kafafi, Z., 1988,Jebel Abu Thawwab: A Pottery Neolithic Village in North Jordan. In The Prehistory ofJordan, edited by A. Garrard and H. Gebel, pp. 451-471. British Archaeological Reports, International Series 396, Oxford. Kenyon, K., 1957,Digging upJericho. Ernest Benn, London. Kenyon, K., 1960, Archaeology in the Holy Land. Praeger, New York. Kirkbride, D., 1966, Five Seasons at the Pre-Pottery Neolithic Village of Beidha in Jordan: A Summary. Palestine Exploration Quarterly 98:8-72. Kirkbride, D., 1968, Beidha: Early Neolithic Village Life South of the Dead Sea. Antiquity 42:263-274. Kirkbride, D., 1978, The Neolithic in Wadi Rumm: 'Ain Abu Nekheileh. In Archaeology in the Levant, edited by R. Moorey and P. Parr, pp. 1-10, Aris and Phillips, Warminster. Kohler-Rollefson, I., 1988, The Aftermath of the Levantine Neolithic Revolution in Light of Ecologic and Ethnographic Evidence. Paleorient 14:87-93. Kohler-Rollefson, I., 1992, A Model for the Development of Nomadic Pastoralism on the Transjordanian Plateau. In Pastoralism in the Levant, edited by O. Bar-Yosef and A. Khazanov,pp. 11-18.Monographs in World Archaeology No. 10,Prehistory Press, Madison, Wisconsin. Kohler-Rollefson, I., and Rollefson, G., 1990, The Impact of Neolithic Subsistence Strategies on the Environment: The Case of 'AinGhazal,Jordan. In Man's Role in the Shaping ofthe Eastern Mediterranean Landscape, edited by S. Bottema, G. Entjes-Nieborg, and W. Van Zeist, pp. 3-14. Balkema, Rotterdam. Kuijt, I., 1995, New Perspectives on Old Territories: Ritual Practices and the Emergence of Social Complexity in the Levantine Neolithic. Ph.D dissertation, Harvard University. University Microfilms, Ann Arbor, Michigan. Kuijt, I., and Bar-Yosef O., 1994, Radiocarbon Chronology for the Levantine Neolithic: Observations and Data. In Late Quaternary Chronologyand Paleoclimates of theEastern Mediterranean, edited by O. Bar-Yosef and R. S. Kra,pp. 227-245. Radiocarbon, Tucson,Arizona. Kuijt, I., Mabry, J., and Palumbo, G., 1991, Early Neolithic Use of Upland Areas of Wadi El-Yabis: Preliminary Evidence from the Excavations at 'Iraqed-Dubb, Jordan. Paleorient 17:99-108. Kuijt, I., and Mahasneh H., 1998, Dhra': An Early Neolithic Village in the Southern Jordan Valley. Journal of Field Archaeology 25:153-161. Kutzbach, J., and GuetterP., 1986,The Influence of Changing Orbital Parameters and Surface Boundary Conditions on Climate Simulations for the Past 18,000years. Journal ofAtmo-spheric Science 43:1726-1759. Kutzbach, J., Guetter, P., Behling, P., and Selin, R., 1993, Simulated Climatic Changes: Results of the COHMAP Climate-Model Experiments. In Global Climates Since the Last Glacial Maximum, edited by H. Wright, J. Kutzback, T. Webb, W. Ruddiman, F. Street-Perrott and P. Bartlein, pp. 24-93. University ofMinnesota Press, Minneapolis, Minnesota. Mahasneh, H., 1995, Es-Sifyia, a Pre-Pottery Neolithic Site in Wadi Mujib, Jordan. Paper presented at the Sixth International conference on the History and the Archaeology of Jordan, June 5-10, Turin, Italy. McCorriston, J.,and Hole, F., 1991, The Ecology of Seasonal Stress and the Origins of Agriculture in the Near East. American Anthropologist 93:46-69. Mellaart, J,, 1975, The Neolithic of the Near East. Thames and Hudson, London. Moore, A., 1973, The Late Neolithic in Palestine. Levant 5:38-68. Moore, A., 1978, The Neolithic oftheLevant. Ph.D. dissertation, University of Oxford, Oxford. Moore, A,, 1979, A Pre-Pottery Neolithic Farmers' Village on the Euphrates. Scientific American 241:62-70. Moore, A,, 1985, The Development of Neolithic Societies in the Ear East. In Advances in World Archaeology, edited by F. Wendorf and A. Close, pp. 1-69. Academic Press, New York. Moore, A,,and Hillman, G.,1992, The Pleistocene to Holocene Transition and Human Economy in Southwest Asia: The Impact of the Younger Dryas. American Antiquity 57:482494. Moore, A,, Hillman, G., and Legge, A., 1975, The Excavation ofTell Abu Hureyra in Syria: A Preliminary Report. Proceedings of the Prehistoric Society 41:50-72. Muheisen, M., 1995, Basta Excavations (198692). Paper presented at the Sixth International Conference on the History and the Archaeology of Jordan, June 5-10, Turin, Italy. Najjar, M., 1992,Tell Wadi Feinan/Wadi Araba: A New Pottery Neolithic Site from Jordan. The NearEast in Antiquity 3: 9-28. Najjar, M., 1994, GhwairI, a Neolithic Site in Wadi Feinan. TheNearEast inAntiquity4:75-85. Nissen, H., 1990, Basta: Excavations of 198689. TheNearEast in Antiquity 1:837-94. Noy, T., 1970, Prehistoric Sites in the Halutza Dunes. Mitekufat Haeven 10:1-10. Noy, T., 1971, Halutza Dunes: A Prehistoric Survey. Israel Museum, Jerusalem. Noy, T., Legge, A., and Higgs, E., 1973, Recent Excavations at Nahal Oren, Israel. Proceedings of the Prehistoric Society 39: 75-99. Pearson, J., 1982, Mortuary Practices, Society and Ideology: An Ethnoarchaeological Study. In Symbolic and Structural Archaeology, edited by i. Hodder, pp. 99-113. Cambridge University Press, Cambridge. Perrot, J., 1968, La Préhistorire Palestinienne. Dictionnaire de la Bible—Supplement8:286-446. Raikes, T., 1980, Notes on Some Neolithic and Later Sites in Wadi Araba and the Dead Sea Valley. Levant 12: 40-60. Roberts, N., and Wright, H., 1993, Vegetational, Lake-Level, and Climatic History of the Near East and Southwest Asia. In Global ClimatesSince the Last GlacialMaximum, edited by H. Wright, J. Kutzback, T. Webb, W. Ruddiman, F. Street-Perrott, and P. Bartlein, pp. 194220. University of Minnesota Press, Minneapolis, Minnesota. Roler, K., 1991, Human Remains from Wadi Shu'eib, Jordan. Ms. on file, Department of Anthropology, University of Nevada, Las Vegas. Rollefson, G., 1989, The Late Aceramic Neolithic of the Levant: A Synthesis. Paléorient 15:168173. Rollefson, G., 1993, The Origins of the Yarmoukian at 'Ain Ghazal. Paléorient 19:91-99. Rollefson, G., 1994, La Néolithique de la Vallée du Jourdain. La Recherche 271:1254-1259. Rollefson, G., 1996, The Neolithic Devolution: Ecological Impacts and Cultural Compensation at 'Ain Ghazal,Jordan. In Retrieving the Past: Essays onArchaeologicalResearch and Methodology in Honor of Gus W VanBeek, edited by J. Seger, pp. 219-229. Eisenbrauns, Winona Lake, Indiana. Rollefson, g., and Frohlich, B., 1982, A PPNB Burin Site on Jabal Uweinid, Eastern Jordan. Annual ofthe Department of Antiquities ofJordan 26:189-198. Rollefson, G., and Kafafi, Z., 1985, Khirbet Hammam a PPNB Village in the Wadi el-Hasa, Southern Jordan. Bulletin of the American Schools of Oriental Research 258:63-69. Rollefson, G., and Kafafi, Z., 1996, The 1995 Season at 'Ayn Ghazal: Preliminary Report, Annual of the Department ofAntiquities ofJordan 40:28. Rollefson, G., Kafafi, Z., and Wada, H., 1994, The 1993 Season at 'Ain Ghazal: Preliminary Report. Annual of the Department of Antiquities ofJordan 38:11-32. 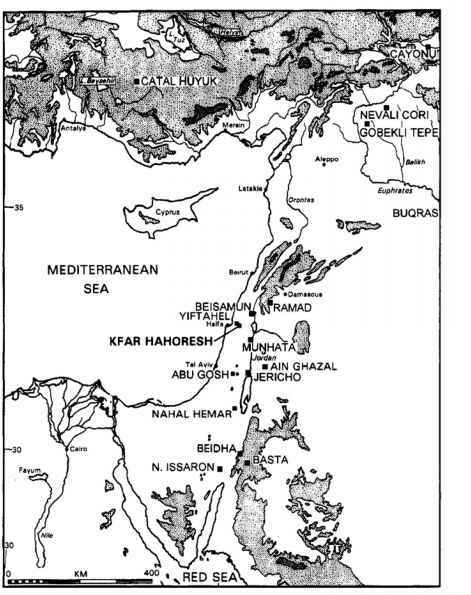 Rollefson, g., and Kohler-Rollefson, I., 1989, The Collapse ofEarly Neolithic Settlements in the Southern Levant. In People and Culture Change: Proceedings of the Second Symposium on UpperPaleolithic, Mesolithic and Neolithic Populations of Europe and theMedi-terranean Basin, edited by i. Hershkovitz, pp. 59-72. British Archaeological Reports, International Series 508, Oxford. Rollefson, g., and Kohler-Rollefson, i., 1992, Early Neolithic Exploitation Patterns in the Levant: Cultural Impact on the Environment. Population and Environment 13:243-254. Rollefson, G., and Kohler-Rollefson, I., 1993, PPNC Adaptations in the First Half of the 6th Millennium B.C. Paleorient 19:33-42. Rollefson, G., Simmons, A,, and Kafafi, Z., 1992, Neolithic Cultures at 'Ain Ghazal, Jordan. Journal of Field Archaeology 19:443-470. Simmons, A,, 1980, Early Neolithic Settlement and Economic Behavior in the Western Negev Desert of the Southern Levant. Ph.D. dissertation, Southern Methodist University, Dallas, Texas. Simmons, A,, 1981, A Paleosubsistence Model for Early Neolithic Occupation of the Western Negev Desert. Bulletin of the American Schools of Oriental Research 242:31-49. Simmons, A,, 1995a, Town Planning in the Neolithic—Is 'Ain Ghazal "Normal?" In Studies in the Histoy and Archaeology ofJordan, V: Art and Technology throughout the Ages, edited by K. 'Ami, F. Zayadine, and M. Zaghloul, pp. 119-122.Jordan Press Foundation, Amman. Simmons, A,, 1995b, Landscape Archaeology and the Exploitation of Natural Resources in the Eastern Levant. Paper presented at the Sixth Conference on the History and Archaeology of Jordan, June 5-10, Turin, Italy. Simmons, A,, and Kafafi, Z., 1988, Preliminary Report on the 'Ain Ghazal Archaeological Survey. Annual ofthe Department of Antiquities ofJordan 32: 27-39. Simmons, A,, and Najjar, M., 1996, Current Investigations at Ghwair I, A Neolithic Settlement in Southern Jordan. Neolithics 2:6-7. Simmons, A,, and M. Najjar, M., 1998, Al-Ghuwayr I. A Pre-Pottery Neolithic Village in Wadi Faynan, Southern Jordan: A Preliminary Report on the 1996 and 1997/98 Seasons. Annual of the Department of Antiquities ofJordan, 42:91-101. Simmons, A,, Rollefson, G., Kafafi, Z., and Moyer, K., 1989, Test Excavations at Wadi Shu'eib, a Major Neolithic Settlement in Central Jordan. Annual ofthe Department of Antiquities ofJordan 33:27-42. Simmons, A,, Rollefson, G., Kohler-Rollefson, I., Mandel, R., andKafafiZ., 1988, 'AinGhazal: A Major Neolithic Settlement in Central Jordan. Science 240(4848):35-39. Stekelis,M., 1973, The Yarmukian Culture of theNeolithic Period. The Magnes Press, Hebrew University, Jerusalem. Street, F.,and Grove, A,, 1979, Global Maps of Lake-level Fluctuations Since 30,000 Years BP. Quaternary Research 12:83-118. Tchernov, E., and Bar-Yosef, O., 1982, Animal Exploitation in the Pre-Pottery Neolithic B Period at Wadi Tbeik, Southern Sinai. Paleorient 8:17-37. Tubb, K., and Grissom, C., 1995, 'Ain Ghazal: A Comparative Study ofthe 1983 and 1985 Statuary Caches. In Studies in the Histoy and Archaeology ofJordan, V, edited by K. 'Amr, F. Zayadine, and M. Zaghloul, pp. 437-447. Jordan Press Foundation, Amman. de Vaux, R., 1966, Palestine during the Neolithic and Chalcolithic Periods. In Cambridge Ancient History, Volume I, pp, 498-520. Cambridge University Press, Cambridge. Vianello, F., 1985, La Preistoria nel Deserto. L'Universo 65:72-89.